Throughout history, death penalty has played a vital role in politics and been abolished in many nations. Also know as capital punishment, death penalty, the sentence of death upon a person through judicial purposes as a punishment for a crime, is atrocious and coldblooded. 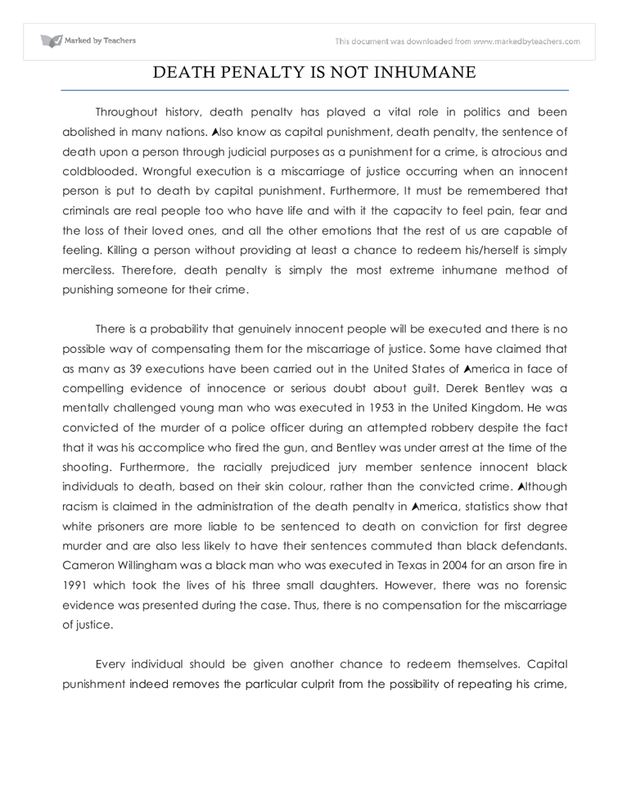 Wrongful execution is a miscarriage of justice occurring when an innocent person is put to death by capital punishment. Furthermore,It must be remembered that criminals are real people too who have life and with it the capacity to feel pain, fear and the loss of their loved ones, and all the other emotions that the rest of us are capable of feeling. Killing a person without providing at least a chance to redeem his/herself is simply merciless. Therefore, death penalty is simply the most extreme inhumane method of punishing someone for their crime. There is a probability that genuinely innocent people will be executed and there is no possible way of compensating them for the miscarriage of justice. Some have claimed that as many as 39 executions have been carried out in the United States of America in face of compelling evidence of innocence or serious doubt about guilt. Derek Bentley was a mentally challenged young man who was executed in 1953 in the United Kingdom. He was convicted of the murder of a police officer during an attempted robbery despite the fact that it was his accomplice who fired the gun, and Bentley was under arrest at the time of the shooting. Furthermore, the racially prejudiced jury member sentence innocent black individuals to death, based on their skin colour, rather than the convicted crime. Although racism is claimed in the administration of the death penalty in America, statistics show that white prisoners are more liable to be sentenced to death on conviction for first degree murder and are also less likely to have their sentences commuted than black defendants. Cameron Willingham was a black man who was executed in Texas in 2004 for an arson fire in 1991 which took the lives of his three small daughters. However, there was no forensic evidence was presented during the case. Thus, there is no compensation for the miscarriage of justice. Every individual should be given another chance to redeem themselves. 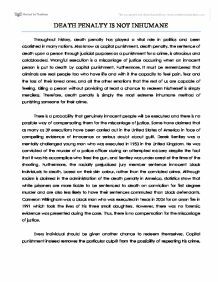 Capital punishment indeed removes the particular culprit from the possibility of repeating his crime, but it does not provide another opportunity to compensate the crime he/she committed. When a girl of eighteen years old is convicted of drug trafficking, does that mean that her whole life is vanished from the moment she was arrested? She is just another teenager who has committed a crime. When a teenager is arrested of drunken driving, they are provided opportunity to rectify their mistake by being a model citizen in future. Thus, every convicted criminal should feel guilty for his crime, and death penalty is not the solution for it. Even the convicted criminals are real people who also have life and the capacity to feel all the emotions that the rest of us are capable of feeling. The mental suffering that the criminal suffers in the time leading up to the execution is excruciating and more agonising than having thousands of pin being prodded into your body. How would you feel knowing that you were going to die tomorrow morning at 8.00 a.m.? The death penalty is the bluntest of "blunt instruments," it removes the individual's humanity and with it the chance of rehabilitation and their giving something back to society. In the case of the worst criminals, this may be acceptable but is more questionable in the case of less awful crimes.